JULIA SPENCER-FLEMING: It's been a while since my last week at the helm of JRW, so I know you're all wondering, "What's going on with Julia's kids?" Friends, I'll tell you. The Smithie (with strong encouragement from her loving mom and dad) is making plans to join her girlfriend down in Austin, TX, with an eye towards the far better job opportunities available in a city that has almost as many people as the entire state of Maine. If anyone knows of a career-level opening in a library, contact me! Otherwise, we'll keep an eye on her to see if 1) she buys herself cute cowgirl boots once she's in Texas and 2) if she succumbs to Austin's vibe and becomes a vegan, dulcimer-strumming hipster. Youngest has 1) successfully completed drivers' ed and now has a permit 2) transferred to a new high school that we think will be the perfect fit for her and 3) converted to Islam. Yeah, it was a surprise to Ross and me, too. 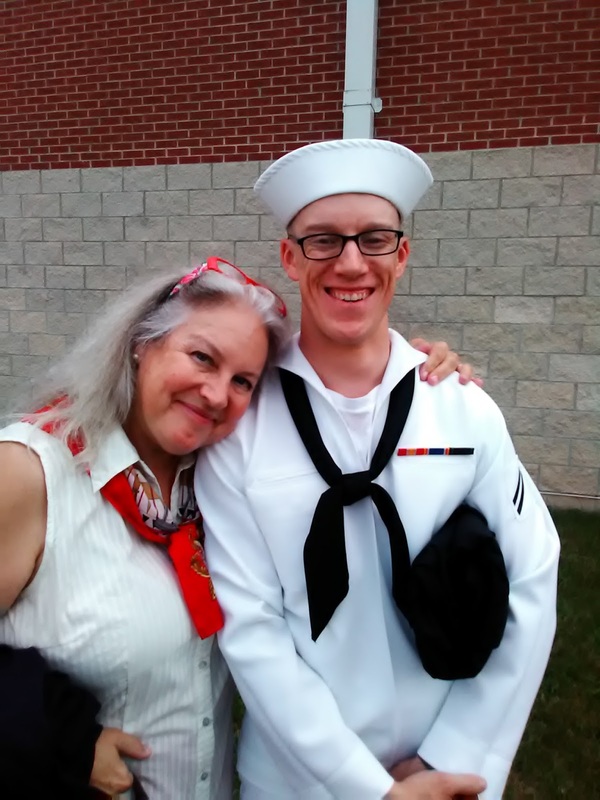 Our exciting family trip, however, was going to Chicago to see the Sailor graduate from Basic Training! He was an honors graduate - in the top three percent of his class - so we got to see him before most of the other parents could see their sons and daughters. He was standing as an honor guard at the division markings and he hardly cracked a smile as his Dad and Youngest and I waved frantically. Alas, no picture, since there were stern-faced NCOs watching the guards. I guess we know know qui custodiet exo custodes. Graduation was not dissimilar to a lot of high school ceremonies, if your kid happened to march into a room the size of three airplane hangars. 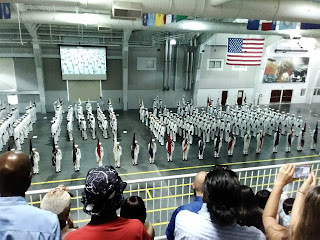 It was all very crisp and exciting, and the Sailor's division gave performances as a drill team (aka rifle twirling), a color guard marching in complex patterns that would have impressed Busby Berkley, a chorus, and of course, a band, featuring My Son the Drummer. You'll all be pleased to know I restrained myself from reenacting the final scene in The Music Man where the proud mother yells, "Play for me, son!" 1. A large group of people marching in step and standing in straight lines looks incredibly impressive. 2. A large group of people in white sailor suits and "Dixie cup" covers looks, even when standing stock still, as if they're about to bust out a tap dance number at any moment. 3. Up close, they are all so young. God bless them. 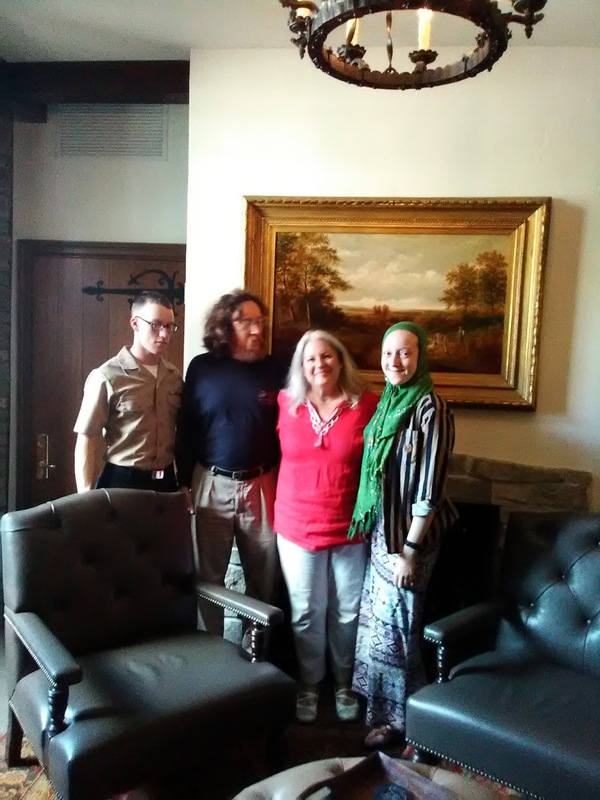 We stayed in Lake Forest, only eleven miles away from the naval station, at a wonderful hotel called the Deer Path Inn, which I can unreservedly recommend to all of you. 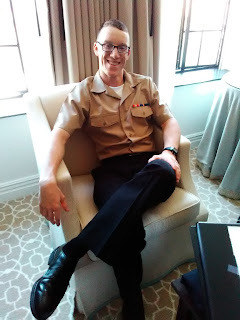 I picked it for the location and because it looked super comfortable and had three restaurants; I figured the Sailor might want to spend some of his liberty catching up on sleep and that none of us would want to spend time sussing out places to eat. As it turned out, he had to remain in uniform at all times and return to base each night by 2200 (ten o'clock), but it was still a very good choice - we were able to relax in the room and linger over our meals, talking and laughing and catching up. At the end of our first dinner together, we were surprised with a dessert buffet we hadn't ordered. "From the lady who had been seated over there," our waiter explained. "She said to tell you congratulations and thank you for your service." Unknown patron of the Deer Path Inn Garden Room, if you read this blog, thank you very much. My son was touched and humbled. He also really loved the chocolate mousse. He has his computer and phone back now he's out of basic, so we get to hear from him more often. Ross and I are considering going back out for Thanksgiving, partly to see the Sailor and partly because the food at the Inn was really good. No, we find we long to see him, now he's a thousand miles away. Proving the old song is true: "How can I miss you if you won't go away?" Congratulations to your son . . . 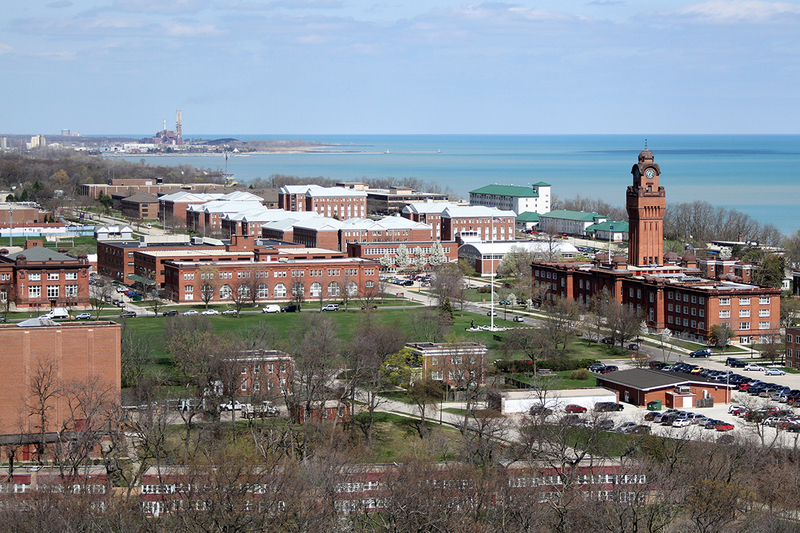 I enjoyed hearing about your weekend at Great Lakes and loved the pictures; your family looks so happy and proud. Many congratulations, Julia! So pleased it's working out for him. Also intrigued by Youngest's decision. I'm sure it's highly personal but I can't help but wonder how she came to it. It IS tough when our kids live far away, though. I know. Exactly, I agreed about the tap dancing!. What a family saga… This is rich and lovely and what a perfect story to read first thing in the morning! Looks like you've raised three great kids. Kudoes to you, Julia and Ross. And now they're scattering to the winds. This weekend my two grandchildren, one three years and one five months old, and I look at them and wonder what the future holds. They each make their own way. Julia, you made me laugh and brought tears to my eyes in the same post. 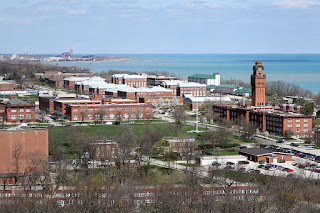 I've been to a graduation ceremony at the Great Lakes Naval Training Station--it is impressive--and they are all so young. But, your son is smiling ear to ear in the photos--you can tell he's exactly where he wants to be right now. And have to comment on Austin--woohoo!! Blow their socks off, Smithie--and get those boots!! And Youngest--I can respect her decision--but secretly sigh at all that glorious red hair--so like her Mama's-- so firmly covered up! Kudos to you and Ross--may your children prosper and find peace and happiness wherever the winds take them! Fortunate kids to be following their hearts with the support of loving parents! Blessings to all. My daughter graduated from The Citadel several years ago, and they have a school-wide parade every Friday, with full dress uniform, color guard and a bagpipe band taking over the entire quad. But the graduation parade was the most exciting event I've ever attended, and for all the reasons you named. Nothing like a bunch of fit young people in straight lines. We raise our kids to think for themselves. Sometimes how they turn out and what they do with their lives isn't exactly what we would choose for them (some of their paths are difficult! ), but aren't we proud when they stand for what they believe? Wow, Julia - congratulations to you and the rest of your family! Totally agree about the company of white-suited sailors. I'm now thinking of that movie - Gene Kelley and Frank Sinatra (?) on liberty in New York? "New York, New York, a wonderful town. The Bronx is up and the Battery's down." Love that white uniform, and the Sailor looks so handsome! And happy! Congrats to him on such an accomplishment. What a beautiful and adventurous family, Julia. You must be so proud of them! Julia, one of the things I most admire about you and Ross as parents is that you have encouraged your children to choose their own paths and supported them in doing so. You all are so close and yet so independent. Wonderful combination! Happiness isn't a cookie cutter path, and I am always glad to see parents recognize that. I know my two children are quite different from one another, and I delight in their varied interests. Your Sailor is a handsome, impressive young man, and I congratulate him and you on his achievements. Since the New Albany Bouchercon and the Reds panel there, your Youngest has been a favorite of mine, and I happy to see her finding her path. And, best wishes to the Smithie in Texas, who I'm sure will go far with her intellect and determination. Thanks on the update! I love your updates about your kids -- what big decisions and transitions they're all going through! As a parent, that must be awesome (and maybe a little scary?) to behold. Julia, I am not even going to try to express how much I enjoyed reading this. Well, I did try and failed miserably. You and Ross and your family are one of THE dearest, coolest, and adorable smart funny and all round best on God's green earth. and i love you. Thanks for your good wishes, everyone! Mary Sutton - the movie is "On the Town," and the thing about the three sailors sticking together? Is true! On restricted liberty, which the Sailor is on for the next few months, he has to have at least two other "Liberty Buddies" with him. FChurch, I sigh for the glorious red hair, too. There's a Prayer for Young Persons in the Book of Common Prayer that I say every week that goes, in part, "Show them that your ways give more life than the ways of the world." So my hope has been answered - just not quite in the format I imagined! Karen: Oh, those glasses. Right after I hugged and kissed him I surveyed that little white cap atop his nearly bald head and those BCGs and said, "Son, you look like the biggest dork in the world." He said, "I know!" Edith - Youngest's path may well be the subject of a blog post in the future, insha'Allah! I take it as a nice compliment when people say that my four daughters are each so different from the other. I pass that compliment on to you, Julia!! You and your husband have nurtured your children to their own paths. Julia, we have the same children: "A lesbian, a sailor and a Muslim," even Great Lakes, Austin and A-School right there. How can that be? But we missed the Deer Path Inn. 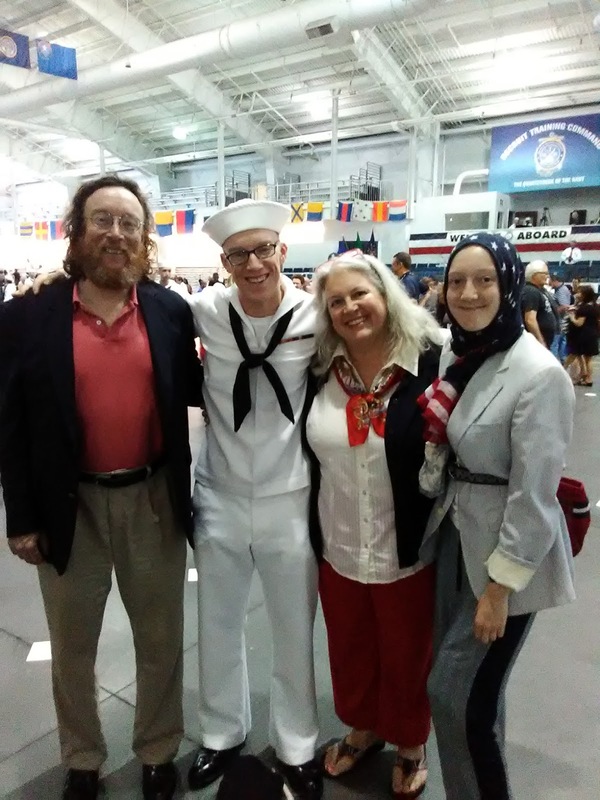 Congratulations, Sailor, and thank you for your service. Sounds like a great time was had by all, Julia. Thank you for sharing. You have a beautiful family.